The idea of making your first trip to Europe can be an exciting one, but also kind of daunting. After all, Europe is a continent full of amazing destinations. I mean, where do you start? Maybe you have an idea of a few places you want to visit or some cities that friends and family have recommended. Still, the idea of planning a trip to Europe all by yourself before ever visiting can be stressful. 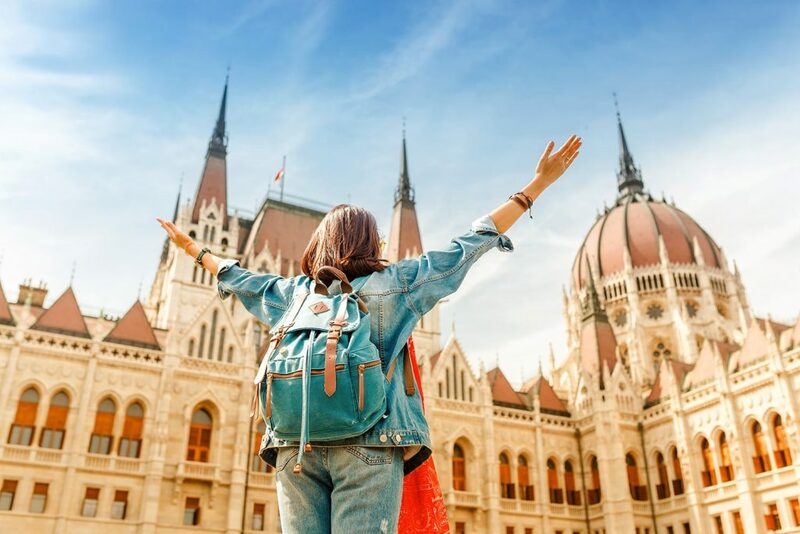 The good news is you’re not alone and you have great travel resources like this Europe trip itinerary to help you plan your first visit. We’ll show you which places to visit and what you have to see and do, plus we’ll explain how to get there and how many days you’ll need to see the best of each location. This way, we’ll show you all the best places to visit in Europe on your first visit to make things a little simpler. I have a feeling you’ll love it so much that you’ll be eagerly planning your second trip as soon as you get home. One of the greatest challenges of planning a big trip like this is working out the best time to visit. Since your Eurotrip is going to take you right across Europe, there are a lot of different climates and events to take into consideration. Whether you choose to visit Europe in summer, winter or during the shoulder season, each has their own strengths and weaknesses. For first-timers, the likely choice is to travel when Europe is at its warmest. Summer may be when Europe is at its sunniest, but it’s also when things are usually at their busiest. If the idea of lines and crowds really dissuades you from sightseeing, then summer may not be the best fit for you. Naturally, if you want to spend a lot of time at the beach during your trip, then summer is the best way to go. Recommendation: If you are visiting Europe in the summer, make sure to book everything well in advance, including entrance tickets to popular attractions. Paying a little more for skip-the-line tickets is totally worth it, as lines can get crazy long and you probably don’t want to spend most of your vacation waiting on line. For more info on how to skip the lines in Europe click here. In Europe, it doesn’t need to be hot to be busy. 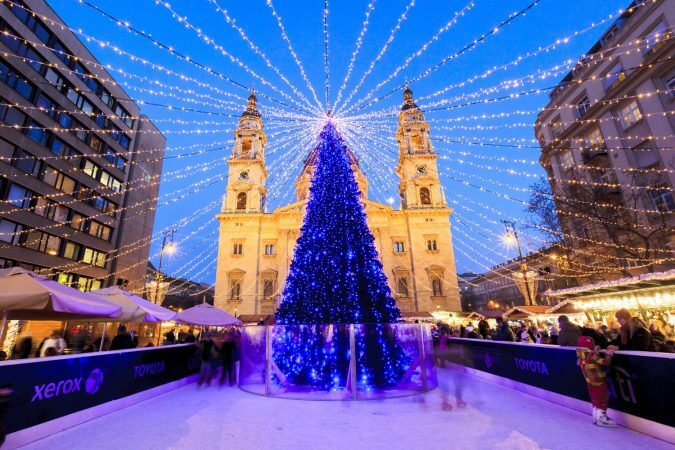 Winter can also be a popular time for travel in Europe since it can be a lot of fun visiting Christmas markets in places like Vienna and Berlin. But it can also get quite cold, so being outdoors sightseeing may not be all that fun. There’s also the concern that certain attractions and sights may be closed during the winter off-season. As for the shoulder season, it tends to share in both the strengths and weaknesses of the other seasons. The shoulder season of early spring and early autumn is ideal for avoiding large crowds of tourists while still getting generally good weather. Still, these months can suffer from more rainy days, not to mention shorter days. Ultimately, it’s all a balancing act. Europe is ahead of the game when it comes to tourism. There are plenty of different services and transport options readily available. You should find getting around Europe to be quite manageable, especially when following the route we have picked out for you. While we’ll talk about transport for each leg of the trip specifically, here are your general options for getting around. For the most freedom regarding when you travel and where you go along the way, the best choice is to drive yourself. With a rental car you’re not limited by the schedules of public transport and can make day trips and stops as you please. For the best car rental prices check out RentalCars.com. Train travel in Europe is famously one of the most popular ways of getting around. Not only do you get to relax and watch the scenery pass by, but with high-speed trains you can make good time too. 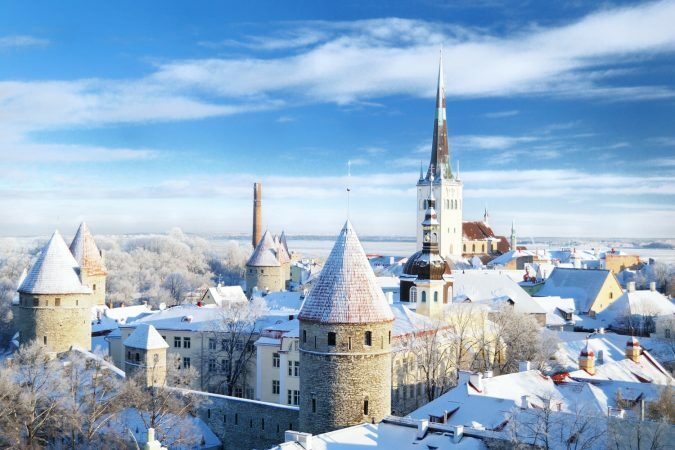 However, to travel Europe by train can potentially be quite expensive as InterCity tickets are often very pricey and may require paying extra for seat reservations. Not as fast as going by train or flying, buses are nevertheless a viable choice for getting around Europe. Buses are usually the cheapest form of public transport and European bus companies like Flixbus and Eurolines can be surprisingly comfortable. Of course flying is always an option when you travel. In Europe you’re spoiled for choice with airlines. While many major carriers have connections to major European cities, there’s also a choice of budget carriers like Ryanair, Easyjet and Wizz Air. Although you have to pay for things like checked luggage and seat selection, they can still work out to be a surprisingly affordable approach. For tips and things to consider when flying with budget airlines check out this post. If you’re looking for a more budget-friendly option, then it might be worth considering a rideshare service like BlaBlaCar. 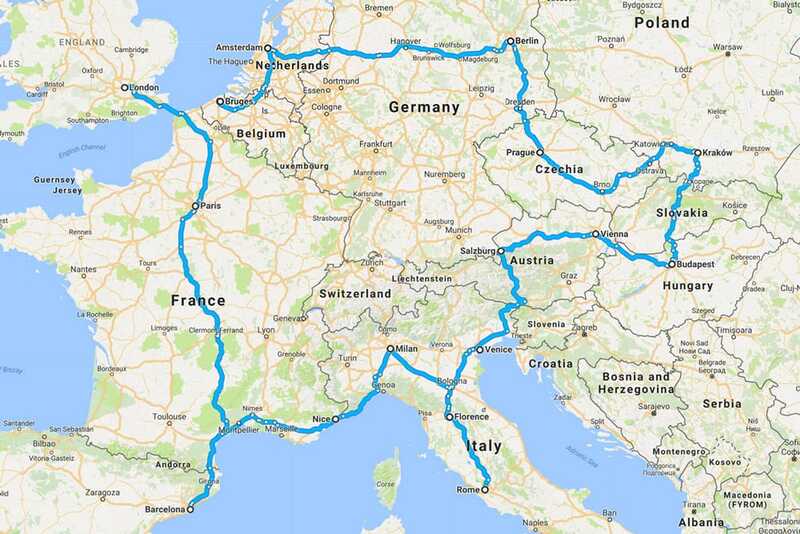 These services let you carpool with people throughout Europe and can be an affordable choice. They also let you meet new people along the way. Similarly, hitchhiking is a fairly common and accepted practice within Europe. Hitchhiking naturally comes with its own difficulties and risks, but for the right people it may be a handy option. Worth mentioning among with all of this is that this Europe itinerary only includes countries that belong to the Schengen Zone, with the exception of the United Kingdom. That means that besides travel in England, you’ll be able to travel freely between the countries under a Schengen visa or visa-waiver for the length of time that it allows. Just as you can travel in whatever style best suits you, you can also find different types of accommodation that meet your needs. Ultimately, the best way to travel Europe is whatever way works best for you, and with Europe, chances are you’ll find something that fits. Accommodation comes in all sorts of shapes and sizes, but it’s always best to book early so you don’t end up paying too much. For those planning on backpacking through Europe, hostels found on Hostelworld are a great option. You’ll find every different type of hostel in the major cities, from budget to flashy, quiet and cozy to a non-stop party. Alternatively, guesthouses, B&Bs and pensions are a popular alternative that manage to be more personal but also still affordable. These types of places, along with hotels of all styles and even private apartments, are best found on Booking.com. There’s also Airbnb, a website that connects you with locals who may have a spare room or even an apartment you can stay in. Airbnb can be a great way to interact with locals or enjoy the comforts of staying in a lived-in space with amenities like a kitchen. For your first European trip we’ve assembled an itinerary that will take you to all the highlights you’ve dreamed about and longed to see. 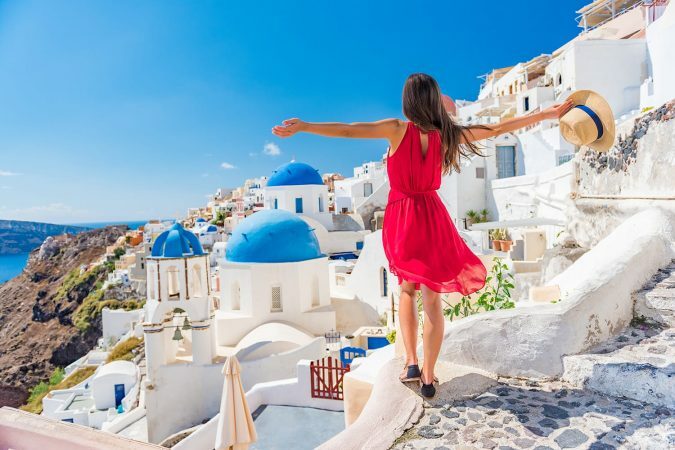 Of course it’s going to take more than one trip to see all of Europe, but this will at least take you to some of the best destinations in Europe and show you just what makes this part of the world so special. 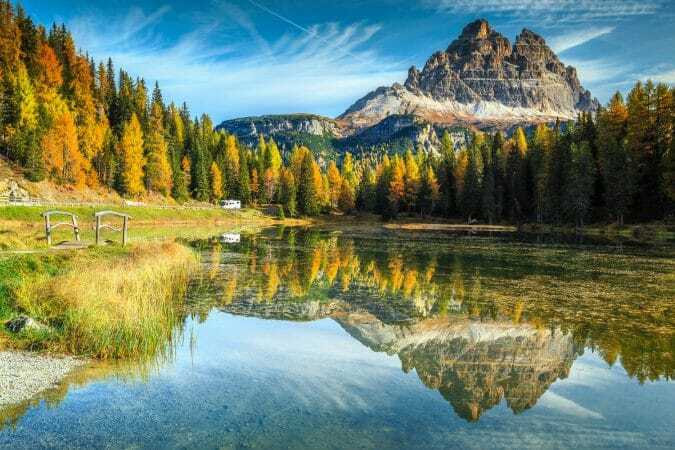 Along the way, this itinerary will take you to the following countries: England, France, Spain, Italy, Austria, Hungary, Poland, the Czech Republic, Germany, the Netherlands and finally Belgium. 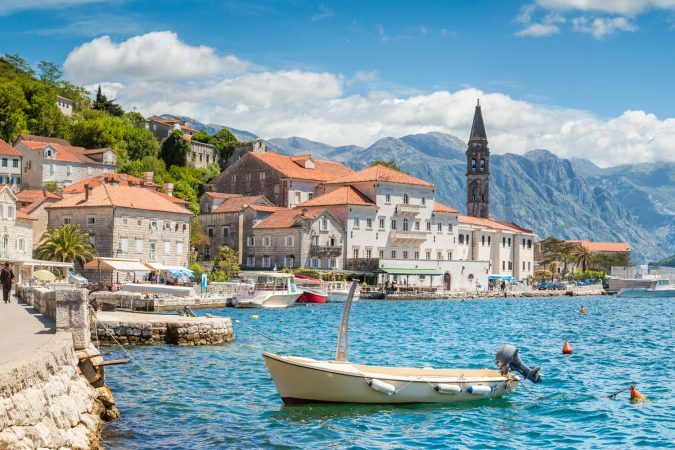 Although designed to show you the best of Europe, you can certainly alter or add places to make this itinerary your own. After all, this is just a sample itinerary for Europe based on some of Europe’s most beloved destinations. No two trips are the same, so feel free to use this itinerary however best suits your needs. However, before we get to our Europe travel itinerary and the best things to do in Europe we just wanted to remind you to purchase travel insurance. You never know what will happen and trust us, you do not want to get stuck with thousands of dollars in medical bills. As a wise man once said, “If you can’t afford travel insurance, you can’t afford to travel.” So don’t leave home without it. We recommend World Nomads. Now with that out of the way, let’s get to this itinerary already, shall we? 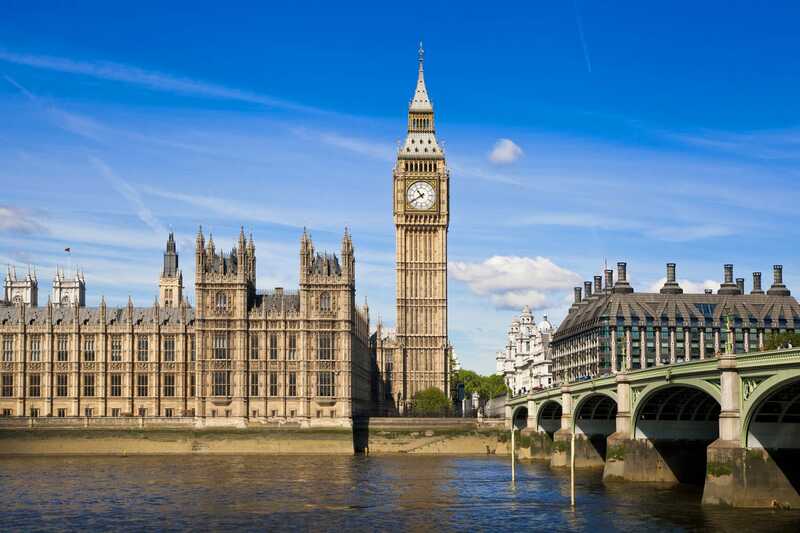 A fantastic place to start your first trip to Europe, London is a great big city with countless things to do. Naturally, you’ll want to take in its highlights, starting with well-known landmarks like Big Ben, the Palace of Westminster and Westminster Abbey. From there you can head down the road and wave to the royal family from outside the gates of Buckingham Palace. Through the centre of the city you can visit popular spots like Piccadilly Circus before being blown away by the exhibits in the British Museum. Following the Thames, you’ll pass Shakespeare’s Globe Theatre then the London Eye and wind up at the Tower Bridge and Tower of London. Getting there: The city of London is serviced by several major international airports including Heathrow Airport (LHR), Gatwick Airport (LGW) and Stansted Airport (STN). Major long-haul flights as well as European budget airline flights to here are plentiful. No matter who you are, all first-time visitors to Europe are going to want to visit the city of Paris. To start, head for the Arc de Triomphe and meander down the utterly elegant avenue that is the Champs-Élysées. Unlikely willing to wait any longer, make a beeline for the Eiffel Tower and see the city from way up high. Back at ground level, be sure to visit both the Notre-Dame de Paris and the Sacré-Cœur, two very important yet different landmarks. Linger at the Sacré-Cœur and explore the enchanting atmosphere that clouds the neighborhood of Montmartre. 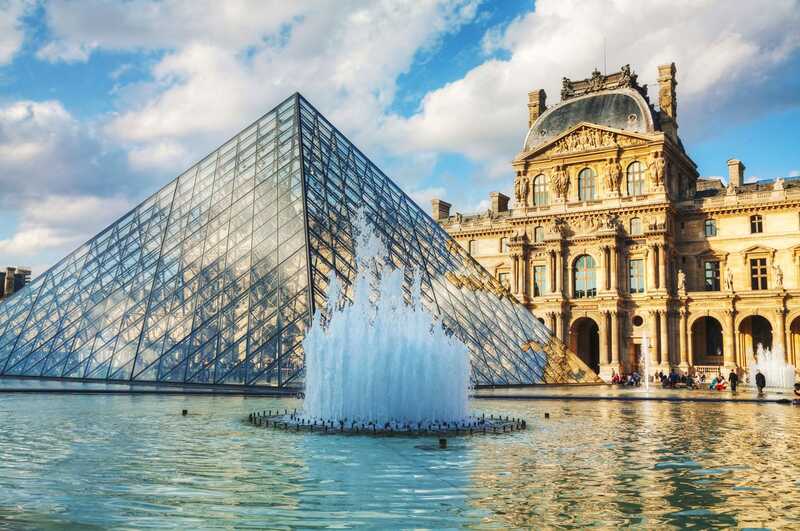 Definitely allow plenty of time for high culture when visiting the Louvre and Musée d’Orsay. That also goes for your trip out of Paris to the unparalleled Palace of Versailles, one of the best things to do in all of France. Getting there: London and Paris are connected by the Eurostar train that crosses through the Channel Tunnel. With hourly trains, the journey lasts 2 hours and 15 minutes. A much cheaper, but considerably longer alternative is to travel by bus, with both day and night departures possible. 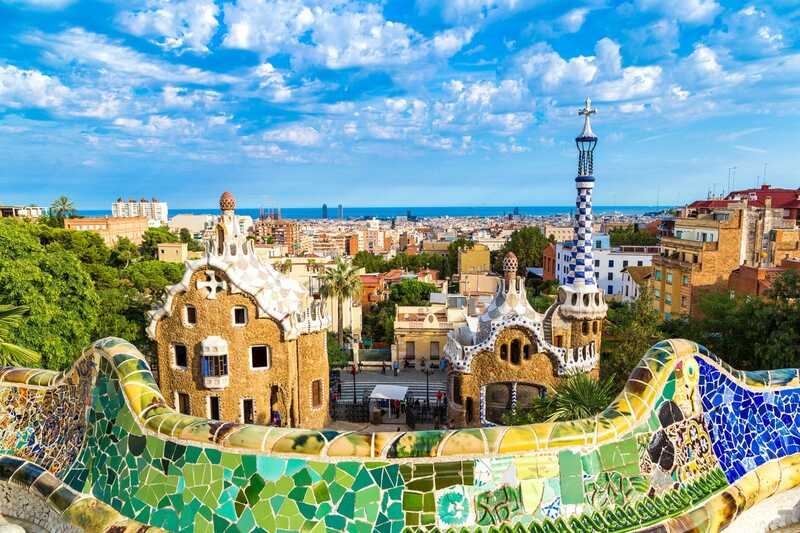 One of Europe’s most popular destinations, there’s a lot to like about Barcelona. A great way to start your visit is to go in search of the creations of Antoni Gaudí, an eclectic architect whose works are unbelievable. 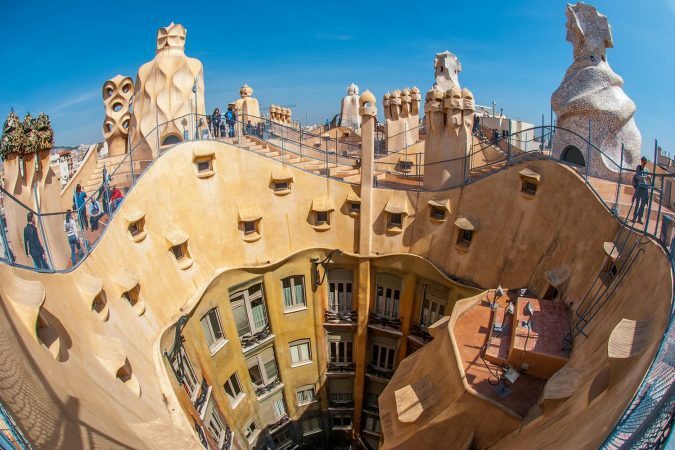 Some of his works include Park Güell, Casa Batlló and the famously unfinished church of La Sagrada Familia. For creativity in a different artistic field, visit the Picasso Museum and see works by the famed Spanish painter. Afterwards, follow La Rambla Boulevard and venture into Barcelona’s beautifully surprising Gothic Quarter. From there, you should certainly spend some time at the city’s beautiful beach. In the evenings, unwind with a nice glass of sangria and make the tough choice of tapas or paella for dinner. Getting there: Several times a day you can take a high-speed TGV train direct from Paris to Barcelona, lasting 6 hours and 30 minutes. Alternatively, flying between the cities with budget airlines like Ryanair will be both cheaper and faster. 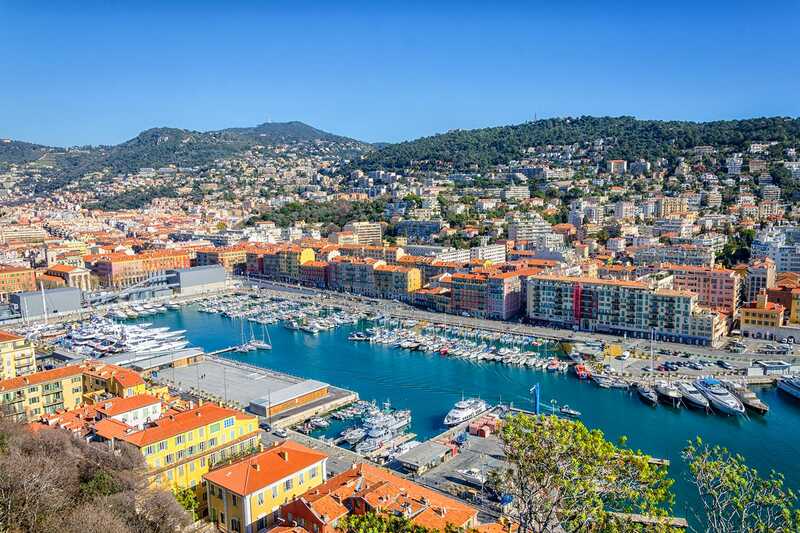 Visiting the city of Nice gives you a great chance to experience the famous French Riviera. Since it’s a coastal city, it only makes sense to start with a good stroll along the Promenade des Anglais that follows the city’s waterfront. Eventually, find your way into Vieux Nice with its traditional narrow streets and colorful houses. Next, venture up to the Castle of Nice for the huge park and superb viewpoints that it provides. Afterwards it’s time for the beach, with public and private beaches to choose from. Public beaches like La Reserve are free to the public, while private ones like Castel Plage require you to pay to access them. Getting there: It’s likely the faster and cheaper option to travel from Barcelona to Nice is to fly between the two on a four-hour flight. Of course, there’s always the option to take an eight-hour high-speed train, transferring in Marseille along the way. 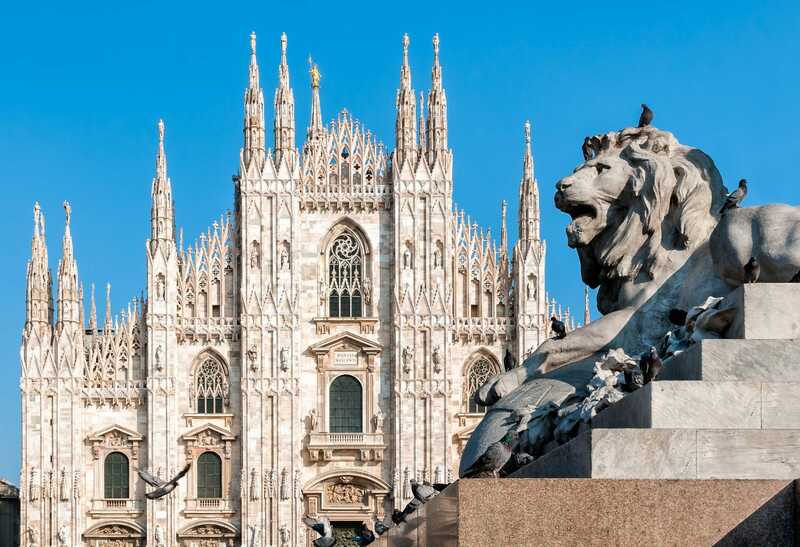 Start your time in Italy with the northern city of Milan, known not only for its fashion but also for having plenty of wonderful sights too. 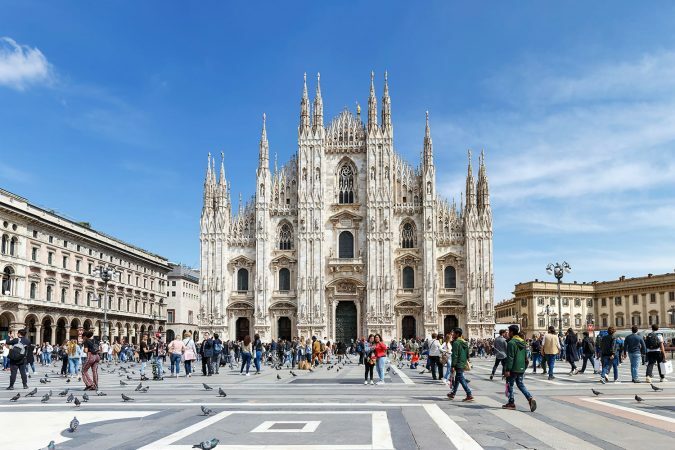 Begin in the Piazza del Duomo in front of the city’s incredible Gothic Cathedral and climb to its roof for some great city views. For further sightseeing, cut through the luxurious arcades within the Galleria Vittorio Emanuele II, where it’s only natural to do a little window shopping along the way. Visit Sforza Castle, taking in the castle but also the grounds of Parco Sempione and Porta Sempione’s triumphal arch. Among Milan’s many churches, one not to miss is Santa Maria delle Grazie where the famous Leonardo da Vinci painting The Last Supper is found. Getting there: Between Nice and Milan three high-speed InterCity trains run daily, taking just short of five hours to make the trip. Taking the bus means a longer journey of over five hours, but it may cost quite a bit less. Explore Florence’s expansive historic centre that is set along the banks of the Arno River. 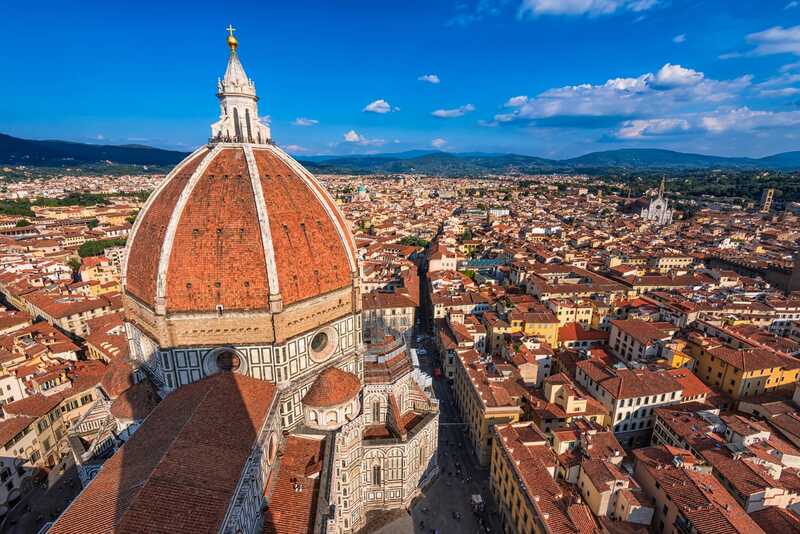 See the city’s immense Duomo, admire rooftop views from the Campanile and experience the splendor of great squares and medieval palaces like the Palazzo Vecchio. Find your way to Piazza della Signoria and all the wonderful public statues of Loggia dei Lanzi. Be sure to visit the Uffizi Gallery and the Galleria dell’Accademia for endless iconic Renaissance artwork. Finish your stay with a walk across the Ponte Vecchio bridge and a sunset view from Piazzale Michelangelo. Getting there: High-speed trains connect Milan with Florence, taking just 1 hour and 40 minutes to get between the two. Train services run roughly every hour, with slower regional connections also possible. Buses are slower again but even cheaper. 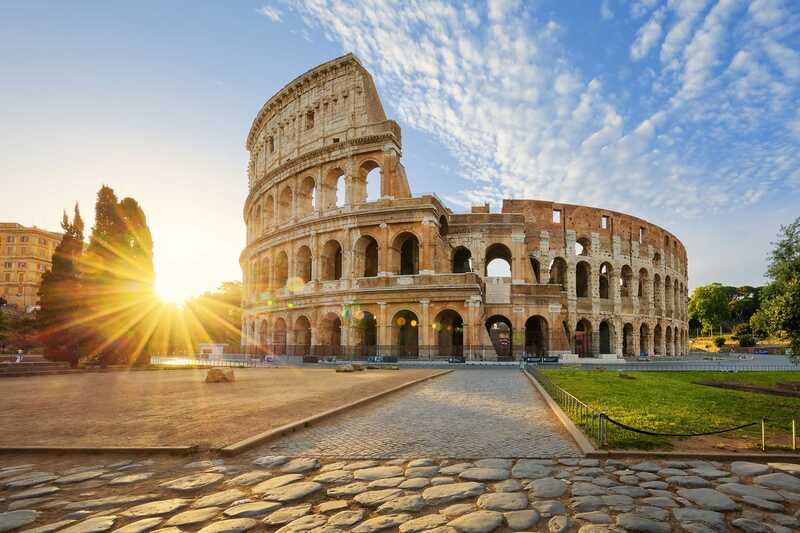 Lovingly called the “Eternal City”, Rome is brimming with ancient sites and landmarks. Starting with the city’s icon, the Colosseum where gladiators fought, take a short walk and you’re at the expansive Roman Forum. Here you’ll find the remains of ancient buildings around a marketplace. More ruins can be found throughout Rome’s city centre like the Pantheon temple and Castel Sant Angelo. Still, Rome has landmarks from other eras too, like the Spanish Steps and Trevi Fountain. Plus, you can’t miss a trip to Vatican City, home to the Catholic Church and its own country, while you’re in Rome. Getting there: There are frequent direct InterCity trains from Florence to Rome, several every hour, that take 1 hour 30 minutes to reach their destination. A city like no other, the floating city of Venice can easily keep you entertained for a couple of days. Working your way along the city’s many canals, make your way to the Grand Canal and look along it from the Ponte Rialto. 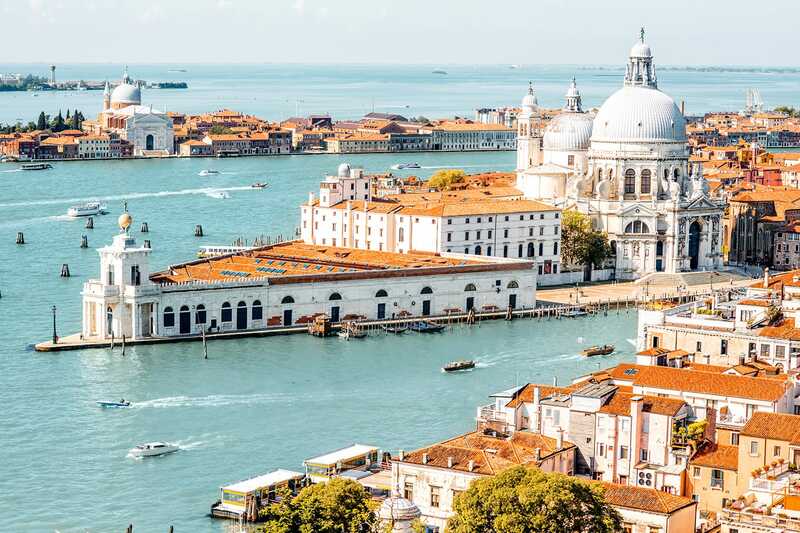 From there, wander the maze that is Venice to the famed St Mark’s Square. 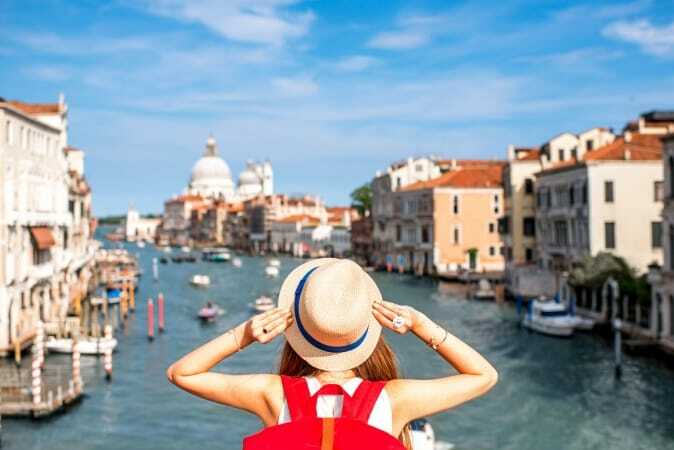 Here you can experience the extravagance of the Doge’s Palace, the Bridge of Sighs, Saint Mark’s Basilica and climb St. Mark’s Campanile for its wonderful views. There are several ways to see Venice from the water, whether it’s with a gondola ride or by taking a vaporetto out to the colorful and creative islands of Burano and Murano. Getting there: From Rome to Venice there are several direct high-speed trains every hour, making the journey across Italy in 3 hours and 45 minutes. While it may take almost twice as long, buses are a considerably cheaper alternative. Across the Alps in Austria you find the musical city of Salzburg, that can be best described as charming. As classical music plays through the streets, wander by medieval and Baroque houses in the Altstadt and revel in the city’s heyday. Find your way to Getreidegasse, a quaint street that also has the house where Wolfgang Amadeus Mozart was born. 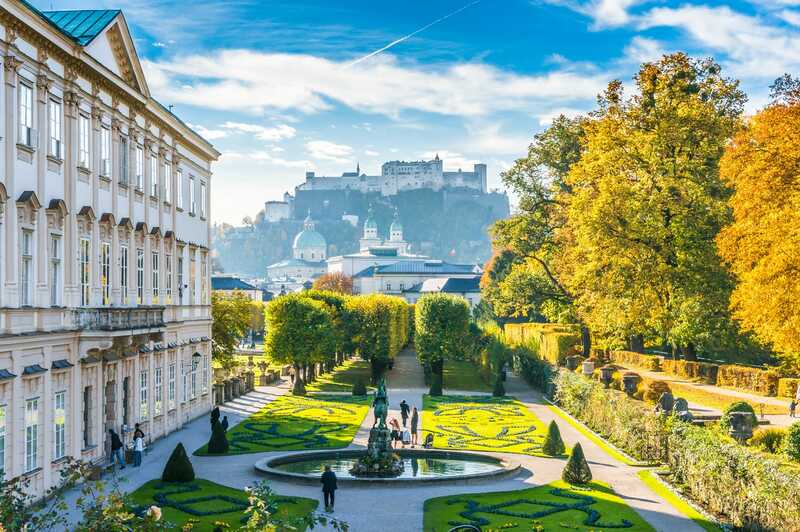 Past the scenic Salzach riverfront, make your way to the pretty gardens of Mirabell Palace where you’ll get a great view of Hohenburg Castle, one of the city’s true icons. With a spare day, you simply have to make a day trip out to nearby Hallstatt, a picture-postcard alpine town. Getting there: The fastest and cheapest route from Venice to Salzburg is to take a bus. The journey takes only a little less time than the seven-hour journey InterCity trains make, which require a transfer in the Austrian city of Villach. It’s also possible to take a direct overnight train from nearby Padua over to Salzburg. A grand imperial city, take time to walk through Vienna’s historic city centre and admire its architecture, especially along Stephansplatz and Graben. 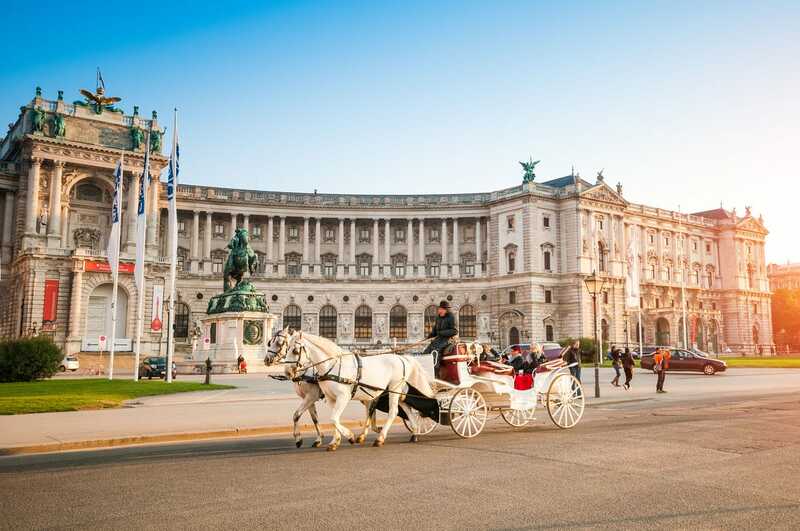 Alternatively, rest your feet and enjoy a carriage ride through the Austrian capital. Stand before magnificent buildings like the Gothic Rathaus and elegant Karlskirche. Try various sweet treats from around the world at the Naschmarkt and spend your evenings listening to concerts of classical music and the opera. Finally, visit one imperial residence after another with the Hofburg palace, Belvedere Palace and lastly with the enormous Schonbrunn Palace. If you’d like, consider popping over to nearby Bratislava for an easy day trip. Getting there: To travel from Salzburg to Vienna you have your choice of two different train companies that both have regular direct trains that take around 2 hours and 30 minutes. Sitting along the Danube River, once in the Hungarian capital of Budapest head straight for Buda Castle. Here you can admire the castle, its grounds and its great view out over the city. Nearby you’ll find another exceptional viewpoint at the picturesque Fisherman’s Bastion just behind the Matthias Church and its ornately patterned roof. From here you’ll spot both the Chain Bridge that you’ll cross, and the city’s amazing Hungarian Parliament that it will take you to. 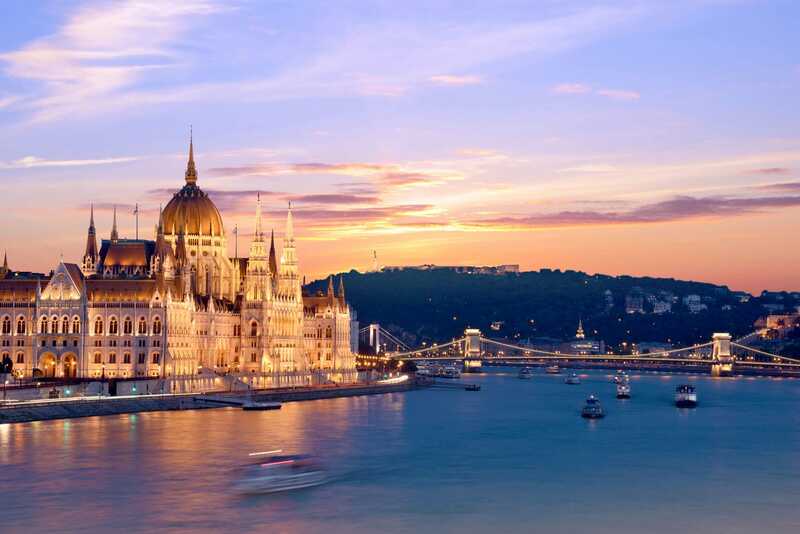 Elsewhere in Budapest, seek out the impressive Heroes Square and the magical sight of Vajdahunyad Castle. Relax in the city’s world famous bathhouses like the Széchenyi Thermal Bath, while also allowing time for day trips to either Szentendre or Lake Balaton. Getting there: Direct InterCity trains connect the cities of Vienna and Budapest, running every hour or two. The train journey lasts 2 hours and 20 minutes, but is considerably more expensive than a slightly slower bus. 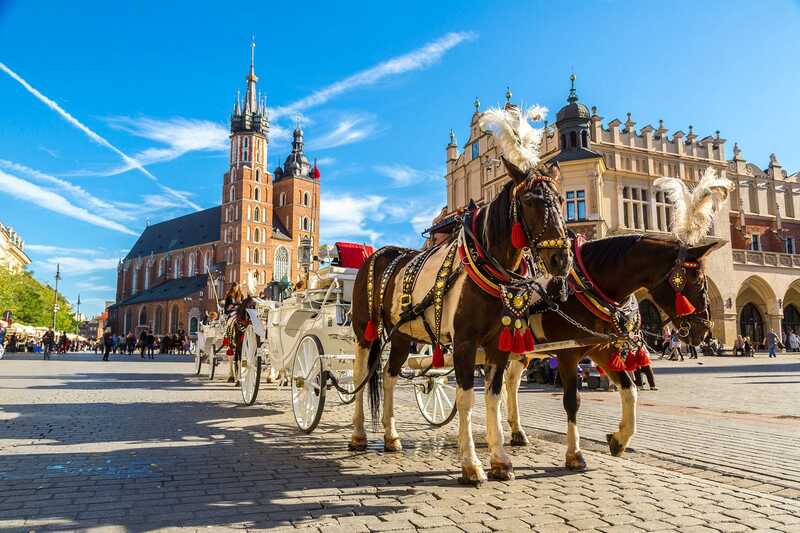 Venture through the beautifully preserved Old Town of Kraków, starting with the city’s Main Square with memorable landmarks like the Cloth Hall and St. Mary’s Basilica. Make your way through its medieval streets to the hilltop Wawel Castle and its fire-breathing dragon below. Learn about the city’s Jewish history in the Jewish quarter of Kazimierz and across the river at Schindler’s Factory where the WWII ghetto was. Don’t forget to indulge in some delicious pierogi, which are Polish dumplings. Getting there: The best way to make the journey from Budapest to Kraków is with a budget airline like Ryanair. The flight will take around four hours, whereas going the much cheaper route by bus will last around twice that. Certainly one of Europe’s most grand cities, the best place to start your Prague visit is in the Old Town Square with its famed astronomical clock. 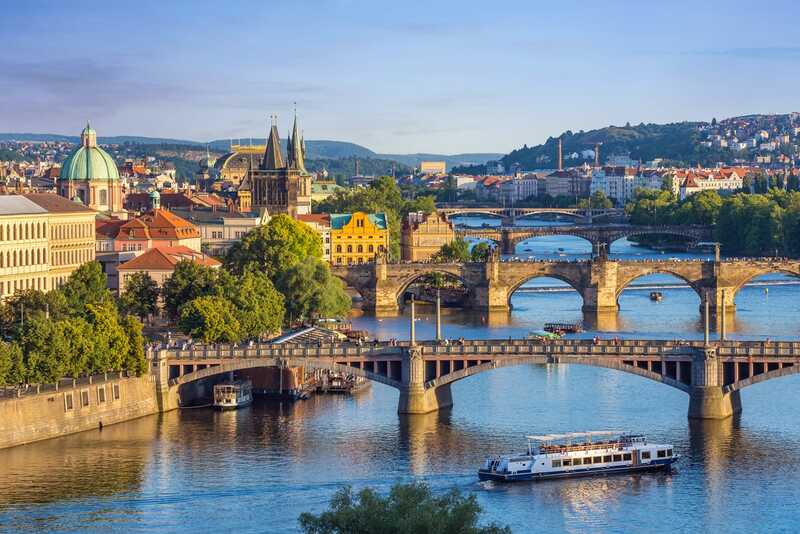 Next be sure to head for another famous landmark, the scenic Charles Bridge, before climbing your way up to Prague Castle to explore the castle’s halls, views and most importantly St. Vitus Cathedral. Take your pick of two incredible libraries, one at the Clementinum and the other at the Strahov Monastery. Learn about some local folklore and history in the city’s Jewish Quarter. If need be, rest one afternoon with a soak at a beer spa where you’ll literally bathe in beer. Getting there: The best approach for getting from Kraków to Prague is likely to get a cheap ticket on a budget airline like Ryanair for the one-hour flight. Both buses and trains tend to take close to seven hours or more, with only a few daily departures. With your first Europe trip you’re not going to want to miss Germany and its cool capital city Berlin. Starting in the historic Alexanderplatz, make your way over Berlin’s picturesque riverfront and head into the city. Following the Unter den Linden boulevard past the Opera House, head for the majestic Brandenburg Gate. Your next stop should be the Reichstag building that has both beautiful architecture and a sorry past. You can further explore those dark days with a contemplative moment at the Memorial to the Murdered Jews of Europe. 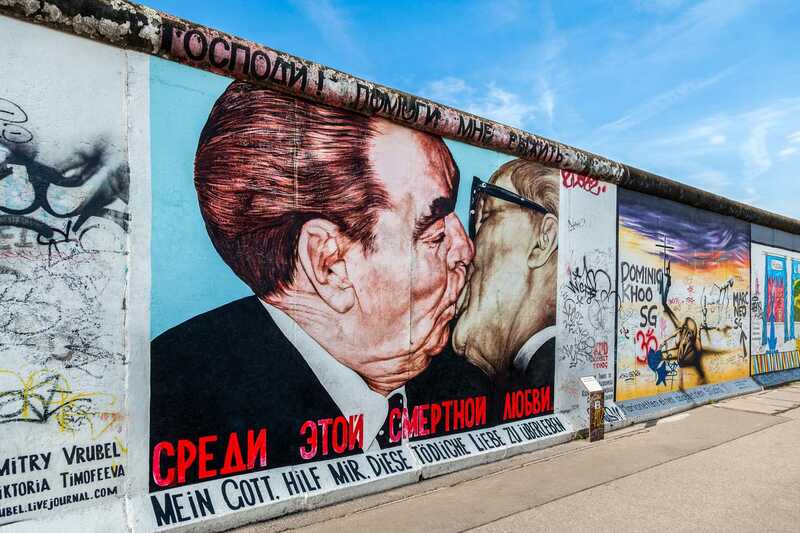 Other important historic landmarks include Checkpoint Charlie and the infamous Berlin Wall, where at the East Side Gallery you can see it covered in all sorts of graffiti. Getting there: There are regular InterCity trains that make the four-hour journey from Prague to Berlin, roughly every two hours. There is also the cheaper option of going by bus, with departures every few hours that require a stop in Dresden along the five-hour trip. With a mix of culture and fun to be had, the Dutch city of Amsterdam is sure to be an amazing time. 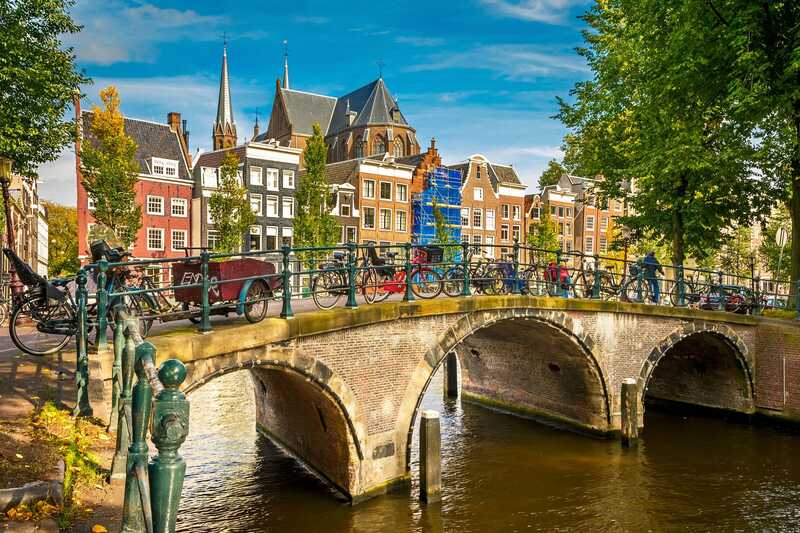 Wander along the city’s many canals to delight in Amsterdam’s scenery, not to mention Dam Square, where you’ll find the Royal Palace of Amsterdam among other landmarks. For some culture and history, make sure to visit the renowned Rijksmuseum and the tragic memorial that is the Anne Frank House. It’s worth also venturing outside the city centre and exploring neighborhoods like Jordaan, the Museum Quarter and Amsterdam-Noord. As for experiences that only Amsterdam can provide, take a walk over to the Red Light District or seek out one of Amsterdam’s many coffeeshops where it’s possible to buy cannabis. Getting there: The quickest and one of the most affordable ways to travel from Berlin to Amsterdam is by taking a four-hour flight with a budget airline. Alternatively, you can take a direct high-speed train that runs every two hours. It would make the journey 6 hours and 30 minutes westward. Treasure some of Belgium’s medieval charm with a visit to the picturesque city of Bruges. 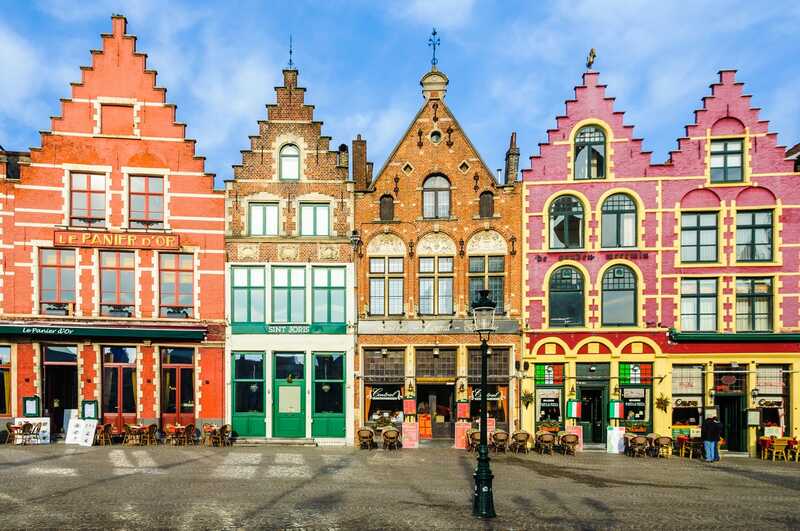 From the city’s central Markt square, take in cherished landmarks from colorful traditional houses to the elegant Bruges Belfry, whose towering spire you can climb for some great city views. To see Bruges from a different angle, take a canal ride along the city’s beloved network of waterways. Head to the Basilica of the Holy Blood to see the church’s relic, said to contain the blood of Christ. Then you can choose whether you want to go window shopping for handcrafts, check out some chocolate shops or try a few Belgian beers. Getting there: The InterCity journey from Amsterdam to Bruges takes 3 hours and 30 minutes. Both services on this route run hourly. Getting home again: The nearest major airport to Bruges is in the Belgian city of Brussels an hour away. Brussels is a major international airport with flights worldwide. Alternatively, you can return to London on a direct Eurostar train that leaves roughly every two hours, with a two-hour trip time. 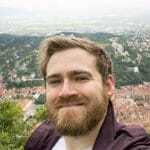 That sums up everything you need to know about making your first Europe trip using this itinerary. With it, your first trip will take you to some superb places and hopefully lead to some great experiences and even better memories.